While he is choosing his cast Brian Tate studies the card of DRAKE, RUTH (who was beginning to feel forgotten). There is a part that would suit her, but it’s a fairly big one and it might be risky to try her out on an occasion like this. On the other hand, newcomers will always remain question-marks if we never gamble on them. After some hesitation Tate decides to book Miss Drake. She gets her second letter from West Region — enclosing a contract to take part in ‘M32′. ‘THIS BIT WANTS PLENTY OF VOICE’ – Owen Reed talks over the script during rehearsal. Norman Kendall, Dorothy Holloway, Phyllis Smale pencil in a note. Leaning behind them Hedley Goodall studies his lines. George Holloway listens, and sketches in between times. On the morning of the broadcast Ruth Drake enters Broadcasting House at 9.45 a.m. and the commissionaire directs her to Studio 2. Rehearsal is called for 10 a.m., and she has come determined not to be late. Other actors and actresses in the cast soon join her, and she begins to identify some of those she has often heard in West Region broadcasts — Phyllis Smale, bright, trim, golden-haired — the bearded, courteous, soft-voiced presence of Hedley Goodall — George Holloway, gravely humorous, with a modesty that belies his long experience of over six hundred broadcasts. ‘TAKING NO CHANCES’ – One ‘repeating groove’ is remembered when ninety-nine faultless shows are forgotten. ‘Smithy’, a West Region maintenance engineer adjusts a gramophone turntable. WEST OF ENGLAND EDITION? 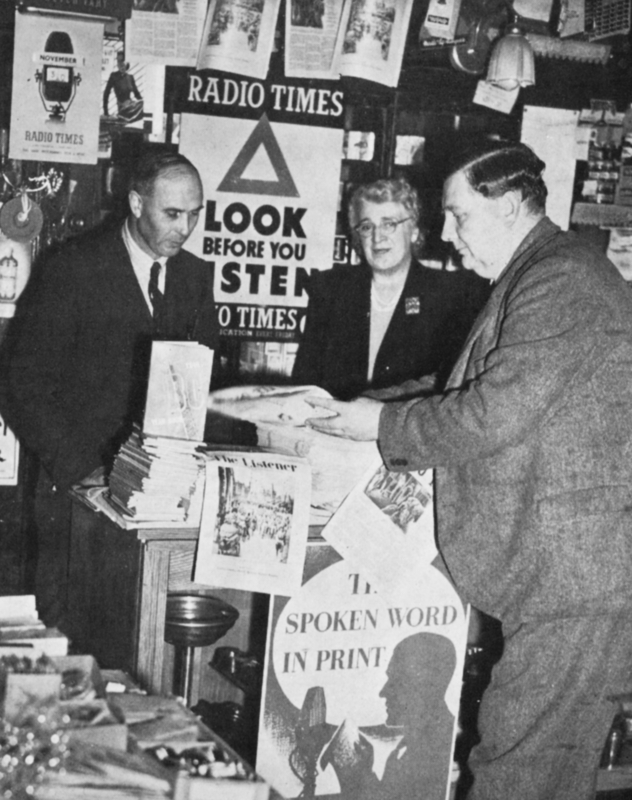 ‘Tiny’ Wildsmith, West Region’s Publications Assistant, sees that newsagents have no difficulty in supplying your weekly copy of the ‘Radio Times’, West-of-England edition. Rehearsal begins with a read-through. Minor errors in the script are corrected, occasional phrases are altered as the speaking of them shows a fault, and there is a lot of talk about studio positions and ‘flicks’. ‘On page three you’re out of doors, Ruth, so you’ll be in Studio 2 — and you wait for a “flick”.’ Studio 2 has a dead out-door acoustic, and a ‘flick’ is a green light on the studio wall which flashes as a cue for the next line to be spoken when it is not an immediate reply to another actor in the same studio. 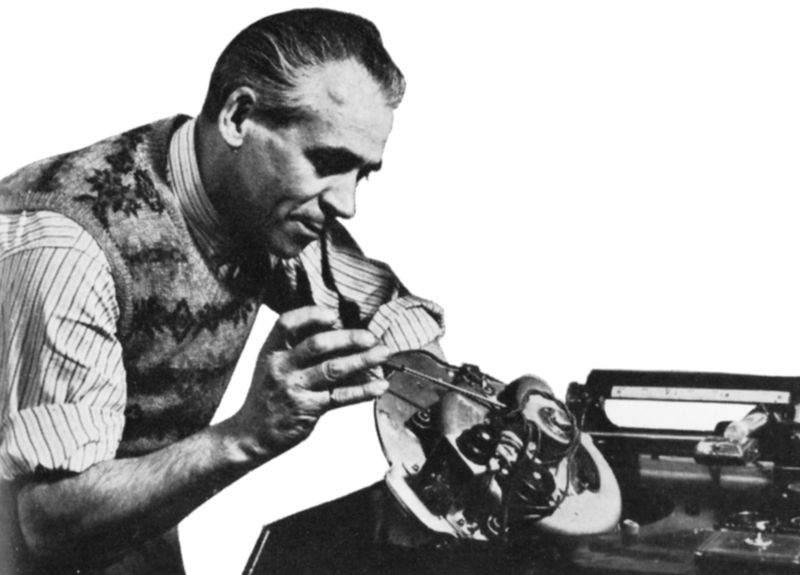 Any transition from music or effects disc to speech, or from one studio to another, is controlled by a flick because in such cases the actor will not usually be hearing what precedes his lines. While the rehearsal proceeds Ruth looks through the double glass window into the control cubicle. 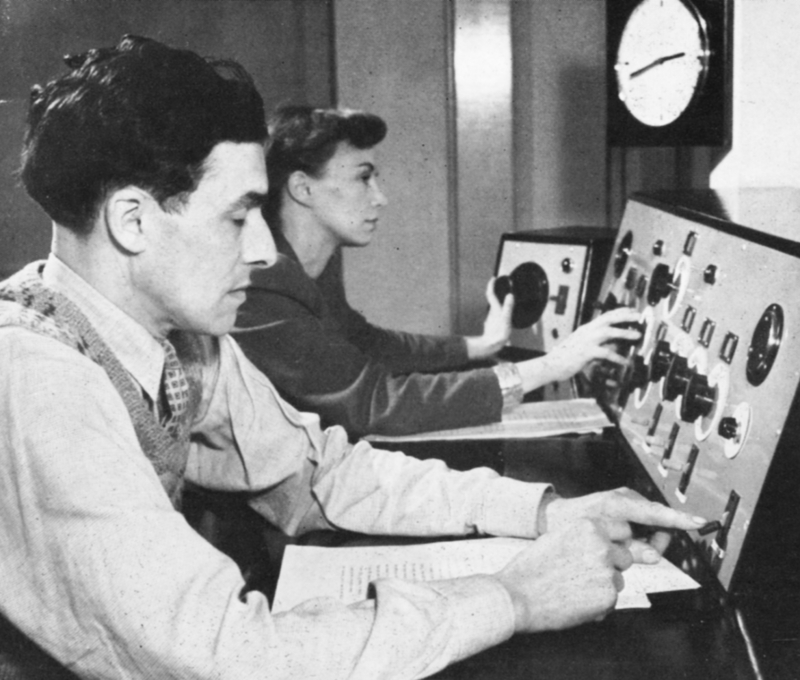 There are three people there — the producer talking into a microphone which carries his voice to the loud-speaker in the studio; a ‘jeep’ (alias JPE, alias a Junior Programme Engineer who works the effects discs on the gram-bank; and a Programme Engineer who ‘mixes’ and controls the programme by means of a series of knobs. Each knob is linked with a microphone which it can bring into play. Labels over the knobs show that the engineer on this occasion is mixing two drama studios, an orchestral studio, a land-line to the M32 factory, and a second landline combined with radio-link to one of the Scilly Isles where a model of the rocket is being tested. The remaining knob — labelled GRAMS — brings in effects noises (in this case, factory sounds). 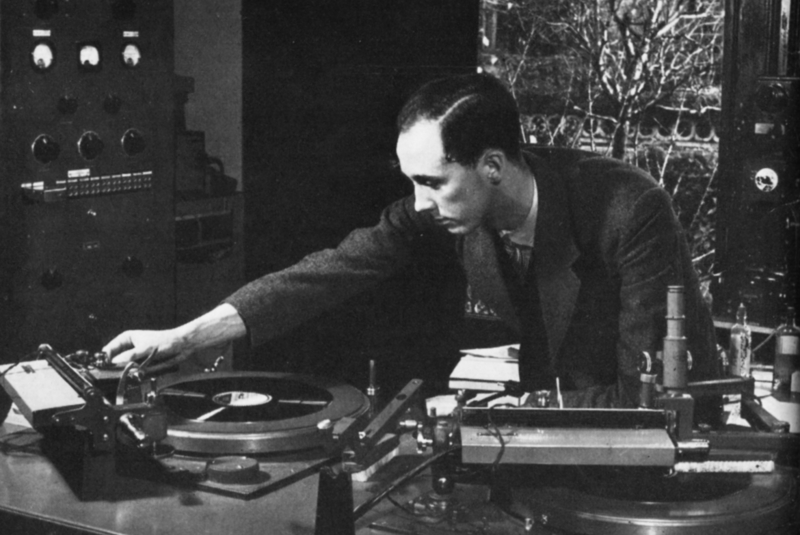 A switch below the knobs controls the green cue-light in the studios; and a final controlling instrument with a needle indicator governs the volume of the total mixture of sound — the programme output — as it travels to the central Control-Room on its way to the transmitters. Delicate and sensitive work is the Programme Engineer’s. During the actual broadcast he — or she — is the nerve-centre of the whole show. A flick to the wrong studio, a twist of the wrong knob — and a smooth production is suddenly thrown into confusion. Nervy work, that needs both the temperament of the artist and the cool precision of the engineer. ‘THE PROGRAMME WAS RECORDED’ – But the fact shouldn’t be noticed. High quality reproduction is vital in broadcasting, and the recording engineers work to exacting standards. ‘FARMER’S GLORY’ – Arriving at Bristol’s Broadcasting House, the familiar figure of A. G. Street brings a Wiltshire voice and a love of argument to the microphone. 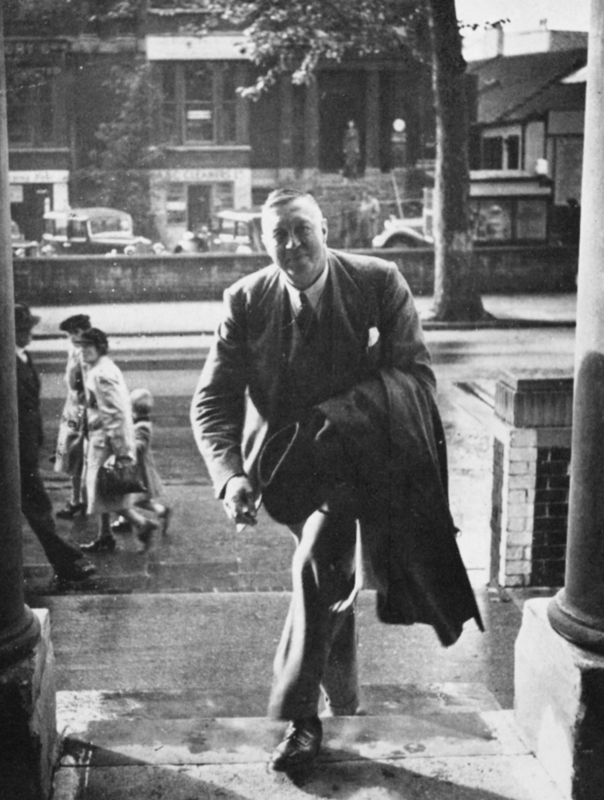 Arthur Street is one of the outstanding personalities in West-country broadcasting. THE SHOW GOES ON – The rugged Lundy coast is often inhospitable. 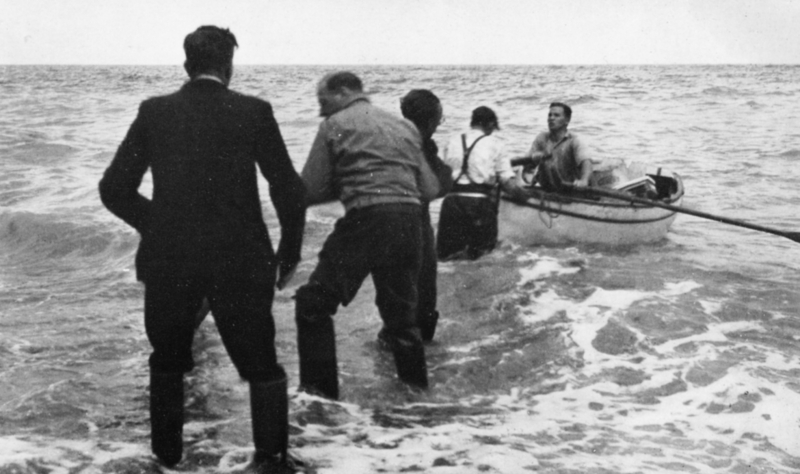 Frank Gillard lends a hand as the engineers hump their gear through the surf. One of the microphones has been drowned already, but the show will go on. ‘DELICATE AND SENSITIVE WORK’ – Programme Engineer, Joan Vaughan, mixes and controls the varied ingredients of the broadcast. Actors, orchestra, recordings, and outside microphone respond to the touch of her fingers and blend together. Beside her Desmond Hawkins directs the rehearsal. THE LUSCOMBES BREAK FOR TEA – A welcome interlude during rehearsal. 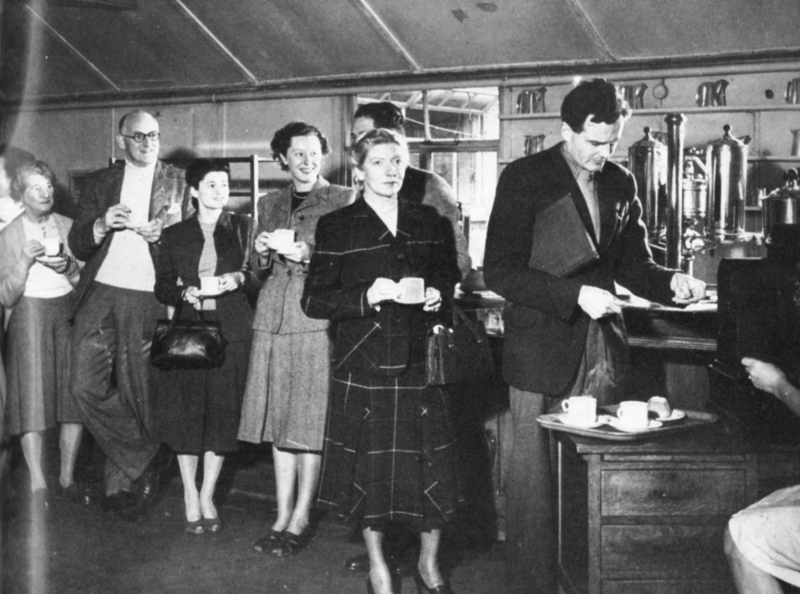 In the Bristol canteen Brandon Acton-Bond heads the queue at the cash-desk. 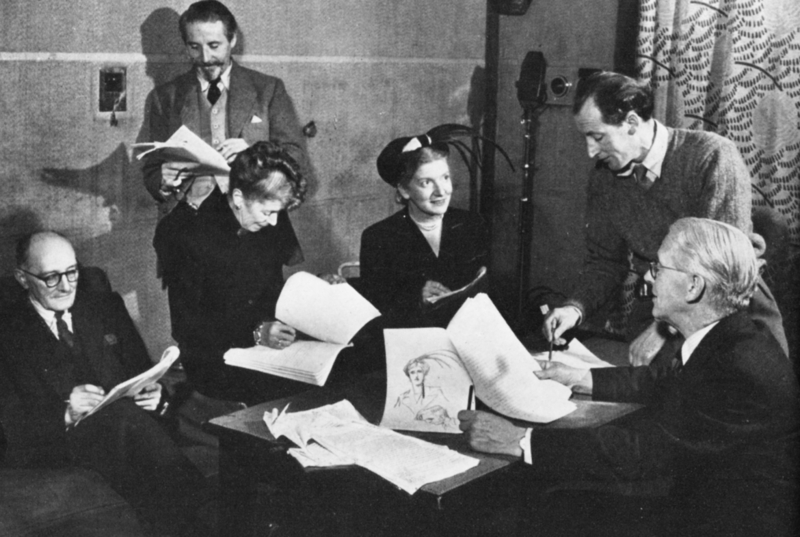 Following him are Phyllis Smale (with Michael Holloway behind her) Peggy Ryalls, Pat Roberts, Lewis Gedge, Nell Oxley, and Sally Lahee.